Is a brand new china cabinet way out of your price range? Doing your own china cabinet makeover allows you to incorporate your personal style while also saving you a ton of money! 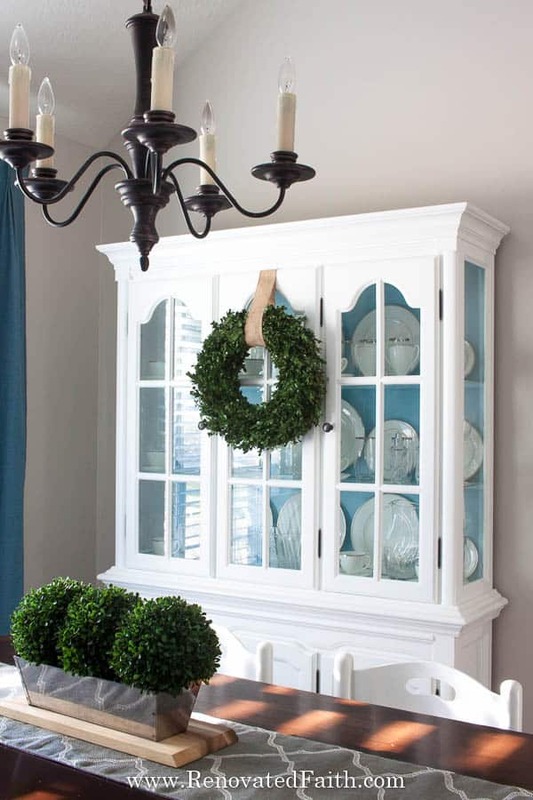 Here are 7 steps to update an old hutch or china cabinet with a little encouragement along the way. On the way home one night, I saw a very tall, almost ominous, object on the curb of a neighbor’s house. In my rear view mirror, I realized it was a huge piece of furniture that would get picked up by the trash truck the next morning. It had been a long day… I had been at the hospital with my mom who just had her second round of chemo. We were almost home, but I knew I needed another look. We circled around to find a dingy oak china cabinet. Several of the doors were broken, it was dirty and even had water damage at the bottom. In spite of it’s orange stain, outdated molding and horrible smell, I saw potential in that old piece. It was just begging me to take it home and make it new again. So, I did what any good Southern girl without a truck would do…I called my daddy! I think he was relieved to have a mental break from my mom’s illness (she is now fine by the way!!!) and somehow my husband and dad wielded the six foot monstrosity into our garage that night. I was determined to save it from its ‘impending doom’ upon trash pickup the next morning. Of course, everyone thought I was crazy for wanting to save it, but it already had a place in my home…and heart. I surveyed the damage, dusted it off and cleaned it up. I was even lucky enough to find an old mouse trap in the top (fortunately it was empty). My dad rebuilt the broken doors at the bottom, I ripped off some of the molding to replace with new and I restored one of the shelves inside. After some sanding, a layer of heavy-duty primer, a coat of paint and a little caulk, it now sits in my dining room as a permanent fixture in our home. After 12 years of marriage, I’ve never had a china cabinet before and I am so pleased with how it turned out. Finally I could unpack all of our wedding crystal and china. It still brings me joy to think about it’s transformation. More than a fun project, the china cabinet serves as a reminder of how far I have come. In the same way, God also saw me in the darkness. He saw that I was dirty, broken, and in a state of disrepair. But that didn’t stop Him. God never needs to take a second glance at your brokenness because He has never taken His eyes off you since the beginning. Through no effort of my own, He delivered me from my sin and certain destruction through Christ’s death and resurrection. Upon accepting Christ as my Savior, my eternal status is secure with Him and I have a permanent place in His heart and home. Now, He is “renovating” me to be more and more like Him every day. God has had to clean me up, release me from my baggage, repair my brokenness and He continues sanding my rough edges to make them smooth. Fortunately, God never leaves a project half-done…He continually works on each one of us, shaping us to be a useful tool for Him to use. That’s what the Christian life is. It is a process of transformation that can only be done by His Hands. We all have areas where we need work – whether it is anxiety, overeating, insecurity, or pride. The world never gives our brokenness a second look. However, God wants to renovate our hearts and minds by taking our brokenness and turning it into something beautiful. Sleek, new furniture pieces sit on the showroom floor to absorb the attention of potential buyers, but it’s the broken furniture on the side of the road that will never catch a second glance. Fortunately, brokenness is not something God rejects but embraces so He can make us whole and new again. 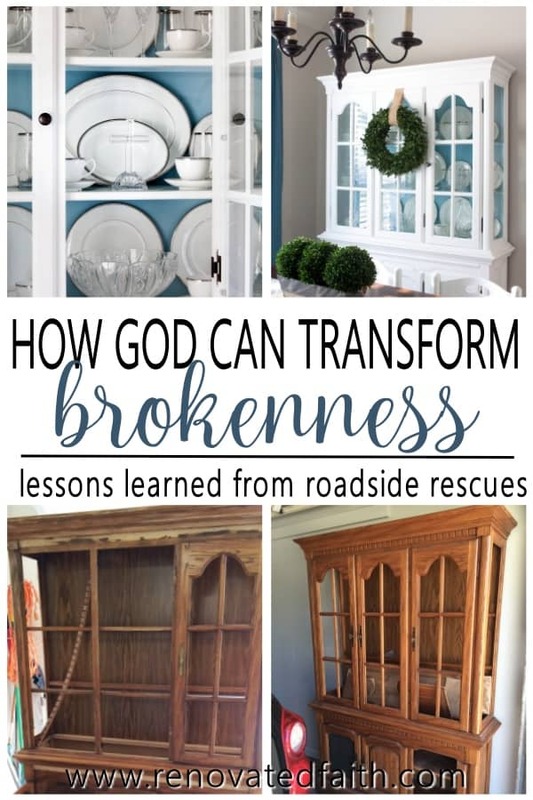 What I had realized in this china cabinet transformation is how God uses our brokenness to do His very best work. Most home improvement projects are messy and can take longer than we previously thought. You might even uncover issues that you weren’t previously aware of and you may need to make several calls for help. However, at the end of the project, the results are breath-taking and the struggle is behind you. You have replaced this hang-up with new habits and the results are amazing. The Lord wants to help you take off your old self and put on your new self. You take off the lies and put on the truth. You take off your cultural perspective and put on a biblical perspective. You might take off what you learned growing up and put on what the Bible says about your situation. Once you come to know Christ as your Savior, that is just the beginning. You have a whole new life ahead of you. 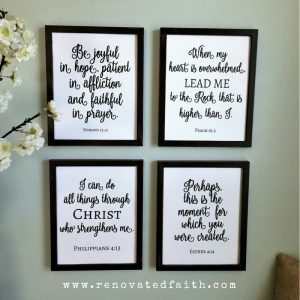 God still has a lot of refinishing work to do on me and I invite you to join me on this journey as He gives us a makeover from the inside out. (As an Amazon affiliate I earn from qualifying purchases. Please see my full disclosure HERE). 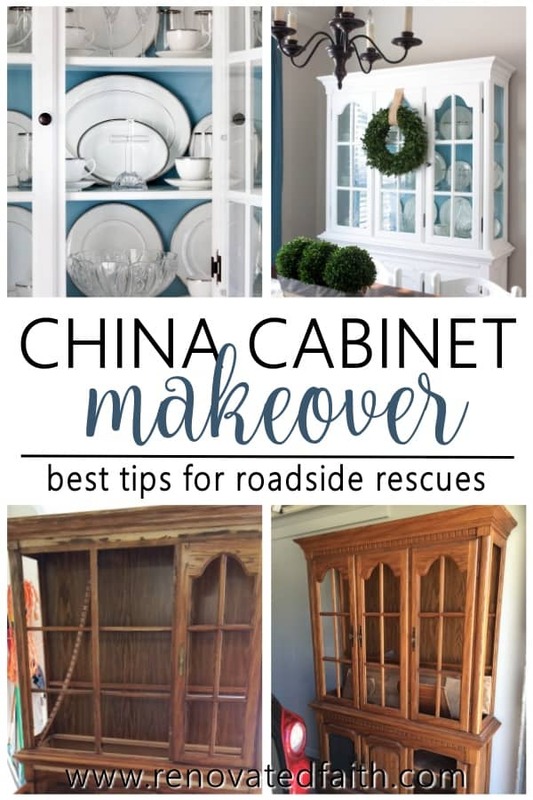 Now that I’ve shared a little bit about what this china cabinet means to me and what it symbolizes, I want to share with you the process so you can enjoy your own furniture transformation. 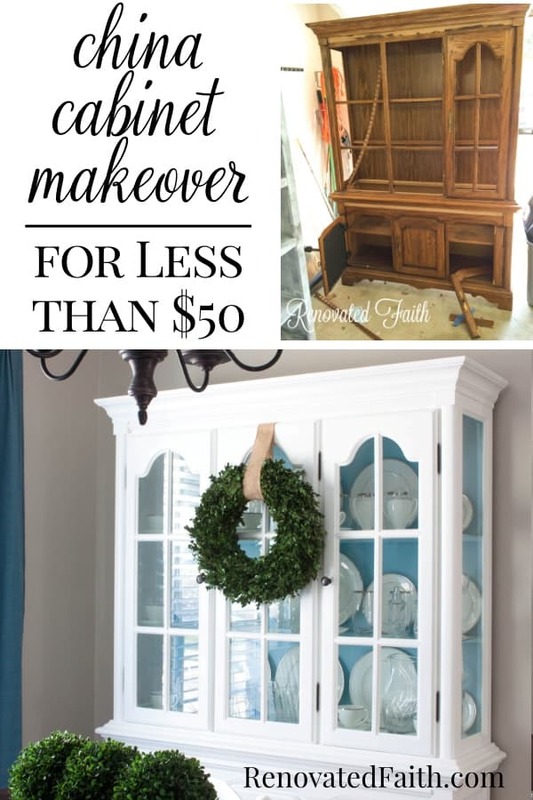 I shopped around and the china cabinets I saw were over $1000 but I spent well under $50 for this makeover! Zinnser Bullseye 123 Primer – If your paint is light or white, don’t tint the primer. If it is dark, tint the primer the same color. Just ask them to help you at the paint counter. It doesn’t have to be an exact match – just darker than white to give you better coverage. I opt for a shade a little lighter than my final coat. This tip will save you from having to add an additional coat in many cases. Paint Brushes – I love these! General Finishes Top Coat – If you piece will undergo a LOT of use (i.e. if you have small children), you might opt for a coat of top coat for extra protection. How to Sand Furniture in Less Than 5 Minutes – This post explains how you are not sanding to take off the old stain or paint. You are just merely roughing up the old surface so the new paint sticks. 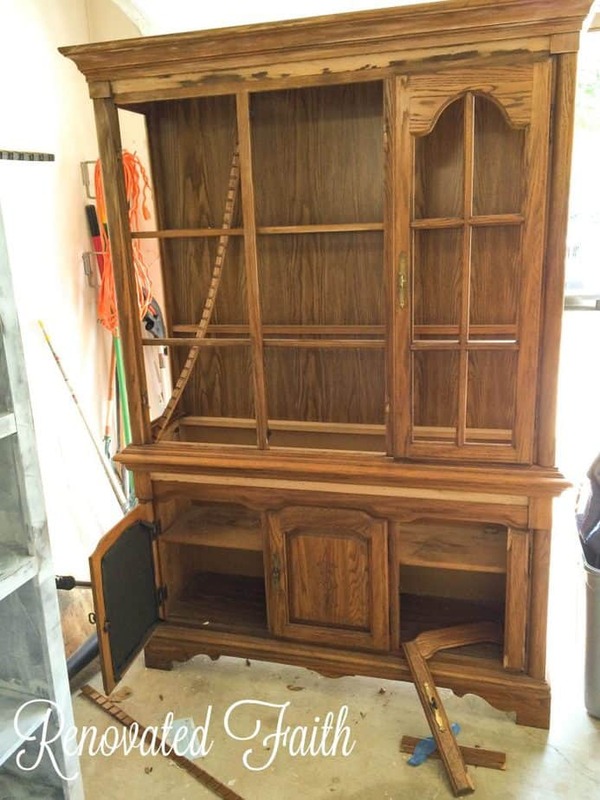 Step 2: China Cabinet Update – Time for Primer! I’ve used several of Zinsser’s primers and decided on the Zinsser Bullseye 123 Water-based Primer. It has great adhesion, cleans up easily, low odor and settles well into cracks, which is great for old oak furniture. Also, it takes only an hour to dry before your next coat of paint. See my tips in the supplies list on saving time when painting with darker paint colors. I painted the inside back in Behr Sonata in Satin to give my white china plates some nice contrast. This is the same blue that I used for my blue pumpkins here. I spray painted the hinges using Rustoleum’s Universal Metallic in Oil-Rubbed Bronze. It is the best oil-rubbed bronze spray paint on the market and so durable that I just used it to spray paint my metal shower frame. You also have the option of spray painting your existing hardware as the Rustoleum spray paint I mentioned above comes in a number of metallic finishes. Add some LED lighting so your china really pops. Here is the link for what I used (LED Under Cabinet Puck Lights) and you can see more LED options by clicking here: China Cabinet Lighting Options (LED). Several options stick on the surface and some are even wireless, which means no drilling holes for wiring. Now that you are done, I’d love to see how it turned out! Post your before and after photos here! What are Other Uses for China Cabinets? There are several options to give you new uses for old hutches. Some include fancy bathroom storage, craft room organization and I’ve even seen someone put led lighting for house plants inside each shelf to use it as a huge terrarium. Most of all I like the idea of using china cabinets to beautifully display decor items. People don’t register for china and crystal like they used to, but that doesn’t mean you can display some beautiful pieces in your china cabinet. 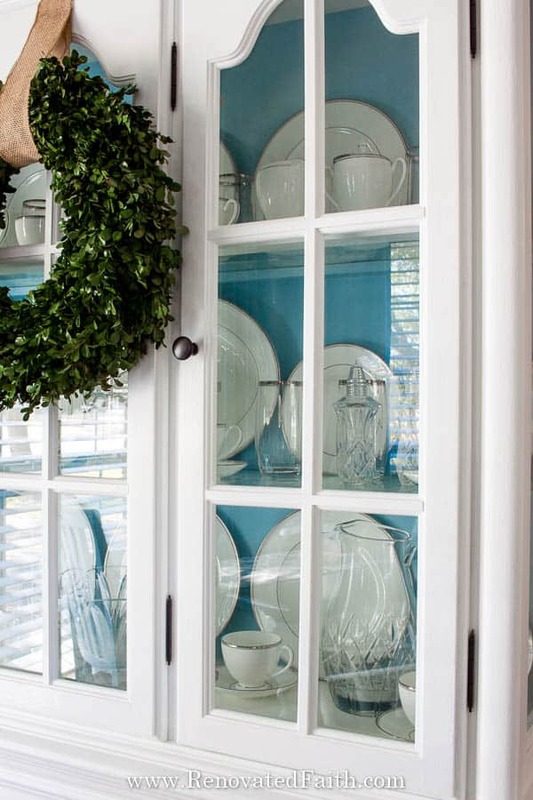 Here’s a fabulous post by Kim at Savy Southern Style with lots of ideas on other uses for china cabinets instead of just dishes. So you have just finished your china cabinet and now it’s time to put all that wedding china and crystal in it. But what is the best way to arrange it??? There are two things I would keep in mind when arranging dishes in a china cabinet. For one, symmetry is your best friend and two, don’t overdo it. In other words, don’t try to fit every single piece of china you own inside of it or it will look cluttered and dated instead of fresh and classy. Take inventory of what you have and start by putting some plates in the back. Go for symmetry which makes this process MUCH easier. Now, put in some of your larger or more important pieces in and then use coffee cups and glasses as filler on the sides. I promise it is easy once you get started. For more inspiration, here are some great china cabinet display ideas with pictures! Can a Hutch Without Glass Still Be Refinished? I’ve had a couple readers tell me they found a china cabinet with broken glass but didn’t know if it was still viable for refinishing. Absolutely it is! Replace China Cabinet Glass – If your glass panels are not curved, you can easily get a quote from a local glass dealer to see how much it would cost to replace the panels and then use the china cabinet retainer clips I mentioned to keep them in place. Plexiglass would be a cheaper option, but scratching can be a real issue. 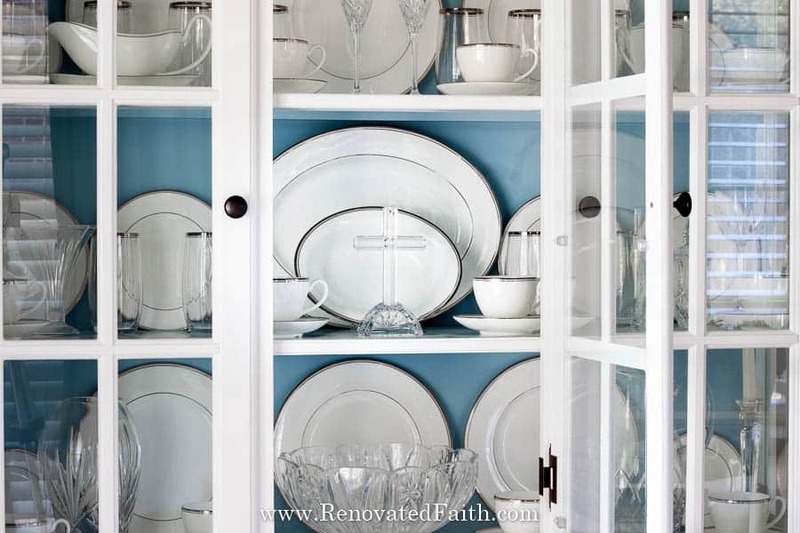 Leave the Glass Out – I’ve seen some really pretty china cabinets that did not have glass. Also, if you are going for a more casual look, you can use chicken wire over your openings like Denise at Salvaged Inspirations in her post Replace Glass with Chicken Wire the Safe Way! 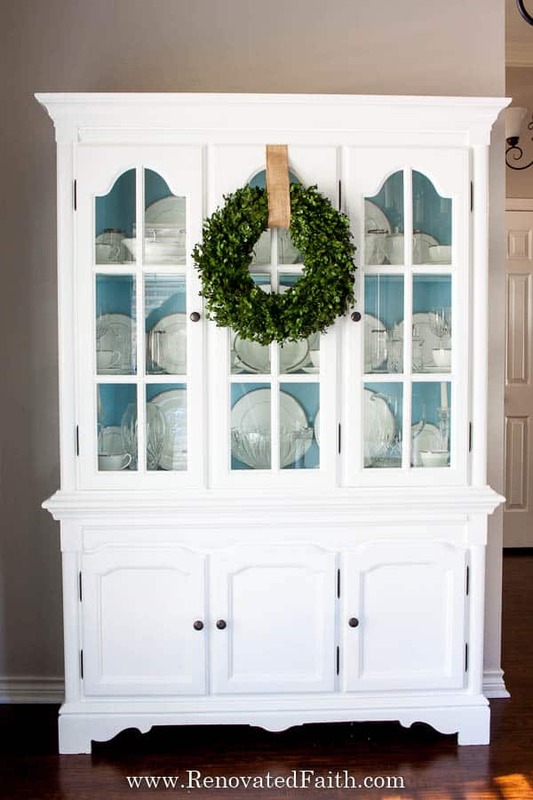 What about China Cabinet Makeovers with Chalk Paint? Would I ever chalk paint a china cabinet? Nope. I have nothing against chalk paint but as I wrote in my post about a better, cheaper and more durable alternative to chalk paint, I would probably opt for this paint process instead of chalk painting any furniture piece. It’s just my personal preference and what works best for me and my budget! But if you are a fan of chalk paint here is a video that will help! 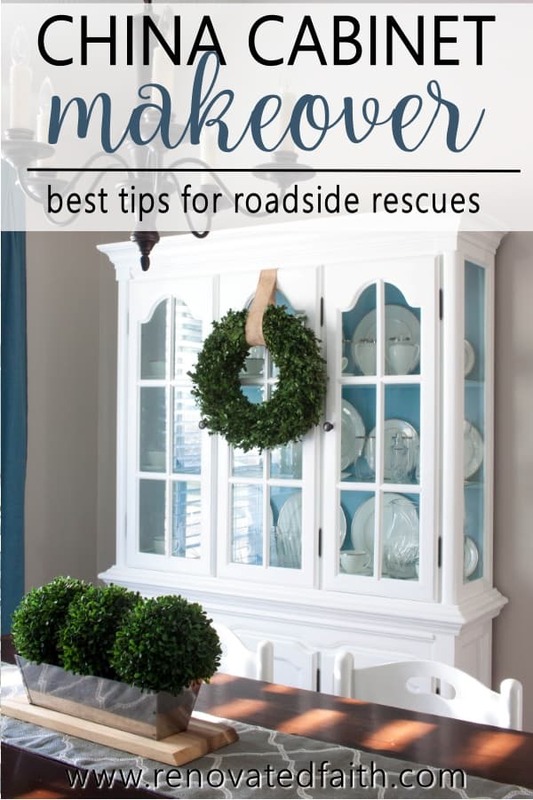 Buying a brand new china cabinet can cost you well over $1000 but you can spend less than $100 by refinishing a china cabinet or hutch yourself. Plus, you get to add your own specific style! Now, head out to your local used furniture store or check Facebook Marketplace for a piece that has serious potential. And as you are looking, remember God sees the same potential in you, loving you not for what you will one day become but how you are right now! Thanks Julie! I appreciate your encouraging words. I love the comparison between the china cabinet and us. Beautifully written and the china cabinet is beautiful as well. You did a great job! Thank you so much Julia! The china cabinet was just meant to be and so was what God showed me through it. Thanks for stopping by. Absolutely beautiful work, Karin! And I love your comparison between broken furniture and broken people. Great post. I am a pastor’s wife and we often save furniture from the trash heap or people offer it to us before they put it there themselves!! We live in Hong Kong, where EVERYTHING is expensive, so I’m glad we can be the recipients of used furniture. I would LOVE to transform our second-hand china cabinet, but I am so intimidated by the project. Your cabinet looks so beautiful and I really appreciate how you wove the gospel into your post. So good. Thank you!! I love this cabinet makeover. 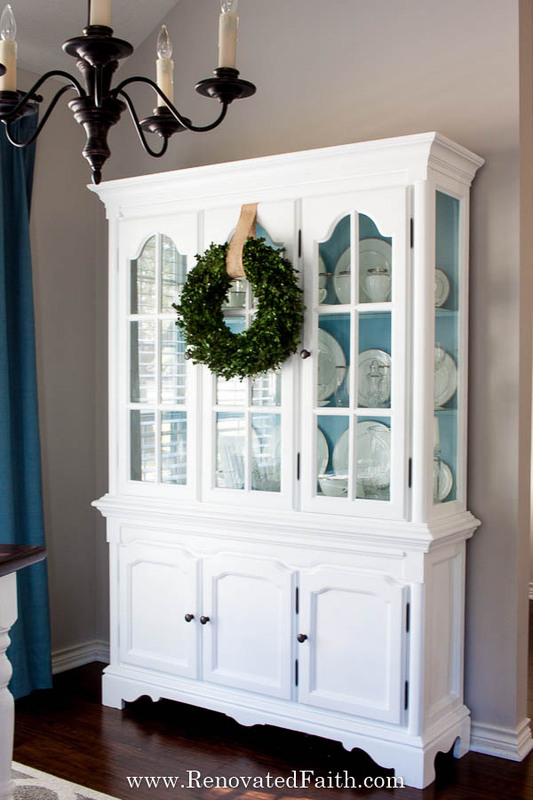 I am looking for a smaller China cabinet like this. I like your article about chalk paint. Now I have a big question.. I bought a wood pine cabinand painted it with fusion mineral paint. Now I want to remove this paint and white wash the wood. What’s the best approach to get all of the paint off and out of the crevices so I can get this whitewash pine look I want? Hmmm… That’s a great question Becky. I would recommend this technique – https://renovatedfaith.com/2018/10/09/diy-driftwood-finish/ . Or the only other option I know is to use a chemical stripper to get off all the old paint. Thanks for stopping by Becky and let me know how it goes!